Caffè Portofino wholeheartedly agrees with the philosophy of this American intellectual of the first half of the 20th century and, inspired by the principle of sharing, presents its wine selection. The wine list offers an assortment of approximately twenty brands: an exquisite variety which not only includes Italian wines, to which more attention is devoted, but also fine French brands, especially champagnes. You can find your wine bar at Caffè Portofino in the roman Prati neighbourhood, located in the famous Cola di Rienzo square. Here you can taste the best Italian and French wines or buy a bottle with which to toast on a special occasion. The Chianti, a wine labelled with controlled designation of origin certifying its high level of quality, produced in Tuscany mainly from the Sangiovese vines and elaborated according to the best production techniques. This wine has a ruby red colour, a winy aroma and a velvety and harmonious taste. The Montepulciano d’Abruzzo, the first Italian wine to obtain the controlled designation of origin and which owes its name to the Montepulciano grape variety. It is a red wine perfectly suited to accompany pork and mutton dishes or a cold cuts and cheese platter. It has a violet colour, an intense aroma that reminds of red fruit and an intense and full-bodied taste. The Traminer, a wine with controlled designation of origin produced in the Südtirol region with a dry and aromatic taste combined with a fragrant rose and lavender perfume. The Cerasuolo, a wine with controlled designation of origin from Abruzzo with a cherry red colour and a fresh taste also suited for aperitifs. The French wine universe is also present in Caffè Portofino’s wine bar. The Merlot, originally from the Bordeaux region, famous for its ruby red colour, balanced aroma and genuine taste. The Cabernet Franc and Cabernet Sauvignon, typical French grape varieties known worldwide. They present a red-tending-to-brick colour, herbal aromas and a full-bodied, distinctive taste. The Chardonnay, a sparkling white wine with a fruity flavour, very fragrant and with a high alcohol content. The Veuve Clicquot Ponsardin, a great French champagne, ideal with freshwater fish due to its delicate taste. 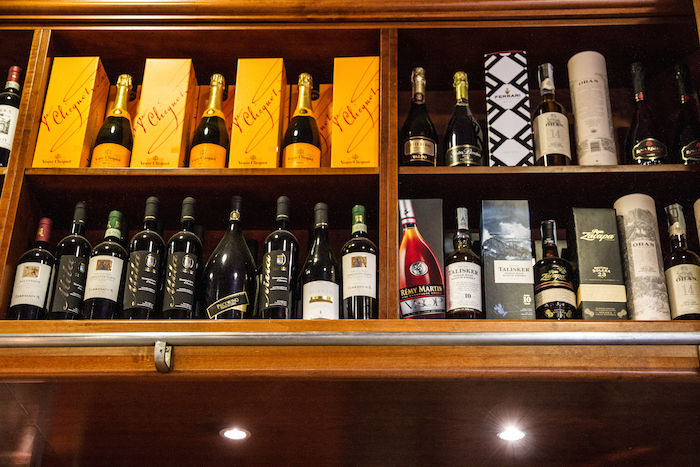 Caffè Portofino also offers its customers the possibility to buy a wine or champagne bottle kept in a cool environment, so that it is ready to be taken away.